Last night, I pulled two current, non-baby-blanket projects out of my bag, and realized that although the yarns are very different content, they're practically the same color. 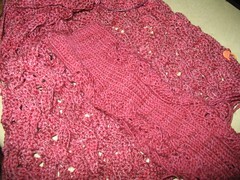 Here's my first Bougainvillea sock, lying on top of my Stonewall scarf. Not only are they the same color, but they are also both Anne Hanson designs! Bougainvillea is being knit out of Lorna's Laces Shepherd Sock in cranberry (color 45ns), while Stonewall is knit from A Piece of Vermont Merino/Tencel sock yarn (no longer available, I think) in Long Time Gone. I just love the not-quite-solid, sort of weathered-looking red of both these yarns. If you make the recipe, don't leave out the mint -- it really adds a sort of subtle taste that's not really minty, but really adds to the flavor I think. I did leave out the parsley tonight, because I forgot to buy some. 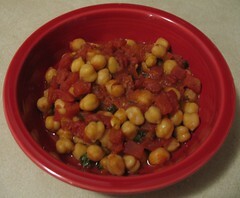 Also, I used diced tomatoes instead of whole ones. One last red thing, although this one makes me sad. I appear to have broken my little red Nikon Coolpix camera. I'll have my brother look at it this weekend (he's handy for stuff like that), but I'm not hopeful. curious face for schedules... passing thru any time soon? Sorry to hear about your camera. Mine stays in my knitting bag. I liked the colors of this post.